As Concepta Riley, the first barmaid to appear behind the bar of the Rovers Return in Coronation Street, Doreen Keogh created the template for a role that would become central to life on the fabled cobbled streets of Weatherfield. 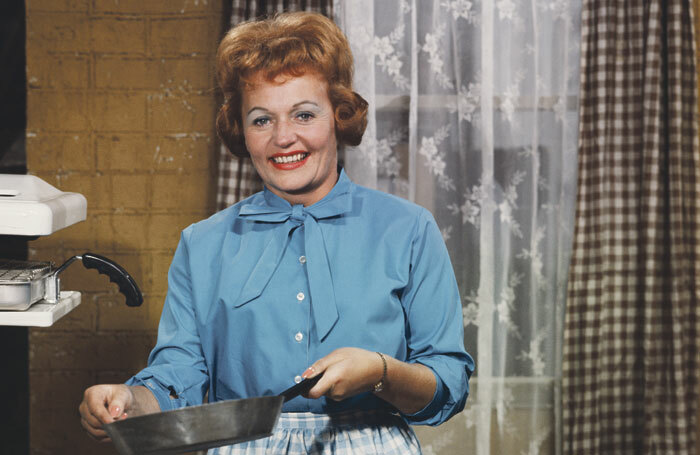 She made her first appearance in the show’s fifth episode in 1960 and remained pulling pints until 1964, returning for short appearances in 1967, 1972 and 1975. Her character experienced the customary highs and lows of soap life, including a marriage that ran into difficulties and death, a troublesome step-daughter, a philandering second husband and the kidnapping of her son. In all, she appeared in 320 episodes. More recently, she was seen in other iconic shows as Mrs Dineen in Channel 4’s Father Ted (1995), marijuana-smoking mother Audrey in ITV’s Cold Feet (1998-2003) and eccentric neighbour Mary in the BBC’s The Royle Family (1998-2006). But throughout her career, Keogh was foremost a theatre actor. A stalwart of the Irish stage from the 1940s, she was born in Dublin and left school at 15 to train at the city’s Abbey Theatre School. On graduating, she became a regular face at the Abbey and Gate theatres before moving to London, where she found work with BBC radio drama, a relationship that continued into her 80s. She made her mark in English theatre in the 1950s, appearing with Maidstone Rep and as Mary Boyle in Sean O’Casey’s Juno and the Paycock at the New Lindsey Theatre in 1954. In 1960, The Stage noted her “wonderful vitality” as the mischievous maid Bernadette in the belated European premiere of O’Casey’s The Drums of Father Ned at the Queen’s Theatre, Hornchurch. In the middle of the decade, her growing television profile led to appearances at regional theatres and in 1970 she played Meg in an updated version of Brendan Behan’s The Hostage “in the days of Ian Paisley” at the Greenwich Theatre. Through the 1970s, Keogh’s versatility came to the fore in plays as varied as Joe Orton’s What the Butler Saw (Belgrade Theatre, Coventry, 1970), Colin Welland’s first stage work, Say Goodnight to Grandma (St Martin’s Theatre, 1973) – “a performance that could easily win the supporting part of the year award”, said The Stage – and Mary O’Malley’s Once a Catholic, which transferred from the Royal Court to the Wyndham’s Theatre in 1977. She made her debut with the Royal Shakespeare Company in O’Malley’s Look Out… Here Comes Trouble! in 1978 and was a memorable Maisie Madigan in Trevor Nunn’s revival of Juno and the Paycock (with Judi Dench in the title role) in 1980. In her native Dublin, she was in the Irish premiere of Jeffrey Archer’s Beyond Reasonable Doubt at the Gaiety Theatre in 1988 and revivals at the Abbey Theatre of Moss Hart and George S Kaufmann’s You Can’t Take It With You (1989) and Hedda Gabler, starring Fiona Shaw and directed by Deborah Warner (1991). The following year, Keogh excelled as the spiteful mother in Michael Harding’s Una Pooka at the Tricycle Theatre with more recent roles including O’Casey’s The Silver Tassie, directed by Lynne Parker at the Almeida Theatre (1995), Oscar Wilde’s The Importance of Being Earnest (Abbey Theatre, 1997) and Brian Friel’s version of Chekhov’s The Three Sisters at Chichester Festival Theatre in 2001. Her film appearances included Darling Lili (1970), Mel Brooks’ History of the World Part I (1981), Some Mother’s Son (1996) and Neil Jordan’s Breakfast on Pluto (2005). In 1970, she coached Barbra Streisand in a cockney accent for On a Clear Day You Can See Forever. Doreen Sheila Elsie Keogh was born on April 10, 1924 and died on December 31, 2017 aged 93. She was married to the actor Frank Singuineau from 1954 until their divorce in 1963 and is survived by her second husband.